Hello friends! I hope you are enjoying a wonderful week! It's so windy here today I'm wondering if we'll have power this afternoon when they say it's "really" going to get bad! My house is already whistling! LOL! Anyway, I have another sneak peek for you. This is a Chalkboard set to be released Friday by Our Daily Bread designs. It's called Chalkboard- Johns. I used today's sketch challenge on SCS for my layout and I stamped the image with VersaFine black ink, then sponged with Brilliance Irredescent White to create a bit of an erased look on my "chalkboard". I used a black base, and My Mind's Eye designer paper, Bramble Rose. I added some burlap ribbon and black pearls, and a wrinkled seam binding bow finishes it off. I love this verse and I think it could be used for many uplifting cards. I hope you'll be back Friday for the release and blog hop! Thanks for stopping! I love knowing you were here!!! It blesses my heart! Gorgeous card, Grace! I love the papers and the chalkboard is a perfect way to showcase the verse! Stay safe during the storms! It's been pouring and very windy all day here. We had thunderstorms, but didn't lose power. Hugs! I don't think that beautiful is an adequate adjective for this card, Grace. It's AMAZING! I love the floral paper, the touch of burlap, the sweet bow, and the chalkboard sentiment. WOWZERS! Thanks for sharing this with us, and please accept my sincere thanks for your participation. I love it! So pretty! I love that chalkboard look, the peek of burlap, and that pretty seam binding bow - beautiful! i love the that verse, perfect verse for the ladies in my bible study since we are set to study John 14 next in our study. These papers are so pretty! The card is awesome! Stunning. I love the layout and colors you used. Thanks for joining us at TTCRD. Hi Grace, this card is very beautiful. I feel I have to do one inspired from your card. As well I thank you for taking part in the Paperminutes Challenge, but where are the 5 paper cut offs? Gorgeous card Grace. Loving the design paper and love how you displayed the sentiment. Looking forward to the new releases! I really like this card. You have made the stamp look perfect! Oh Wow this is GORGEOUS!!!! I love love the scripture inspired by the chalkboard look! A truly stunning creation! I am swooning over your burlap and ribbon treatment too! Eek! I love this! very pretty, just love the texture the burlap gives it, love the chalkboard look! What an awesome stamp for the chalkboard technique! 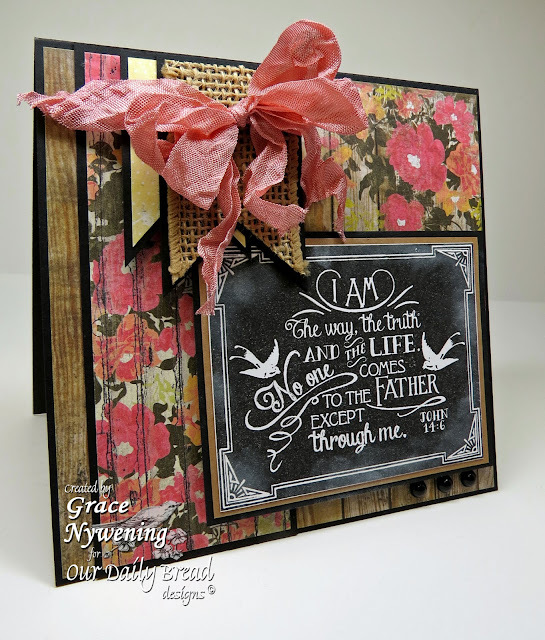 I'm so glad you worked that gorgeous woodgrain paper in there so you could play along with our challenge at TSG. Good luck! Grace, this card speaks to me!! So beautiful!! Such an elegant card, beautifull words and the layout and textures are perfect. Arriving at your blog is like a refshing drink of ice cold water after walking five miles of dusty road in very hot wether. It is just so BEAUTIFUL. Thank you for joining us at Word Art Wednesday, we love seeing your wonderful art work and appreciate you taking time to join our challenge. Super gorgeous, Grace. Such an elegant card. Gorgeous card. I love the huge bow. Grace, this is a true work of art! Such an elegant design! Thanks for sharing with us at The Ribbon Reel! Beautiful card Grace - love the DP's and the lush bow. Stunningly beautiful card you have created, love the different layers and the textures too on the different layers. Great way to show off the sentiment it looks like a blackboard easel. Thank you for sharing with us at Lady Anne's Challenges. I hope we see you again soon. What a beautiful card! I love the chalkboard effect! I have so enjoyed your music too! Thank you for joining us at Forever Friends. Hope to see you at our next challenge too! Hugs and God bless.